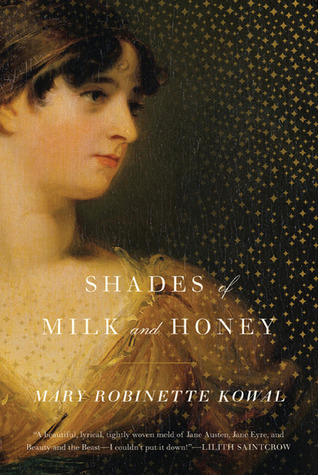 Quick on the heels of the rather beautiful and understated Shades of Milk and Honey comes Mary Robinette Kowal's latest book about Jane and her lovely husband Vincent. I absolutely loved the first novel and was chomping at the bit to get the next installment. I am happy to say that it does not disappoint. In Shades of Milk and Honey, Kowal introduces us to a world that is a mirror image of Jane Austen's Regency England. This wonderland contains a type of magic called glamour that is primarily used by women for aesthetic decoration. Jane, our lovely and pragmatic protagonist falls in love with the gruff Vincent and they become a glamourist team. Even though I'm not a big fan of Jane Austen or romance novels, I fell so hard for the beautifully told story of Jane and Vincent. It was pitch perfect for the time period and I have since loaned it out to friends and family, happily exclaiming "it's like Jane Austen with magic, and it's AWESOME!". My mother, who reads mostly Jane Austen and romance novels, loved the hell out of it, even though she can't stand books with "that magic stuff" in them. If that isn't a seal of approval, I don't know what is! As you can imagine, I was incredibly excited for the sequel to come out. Glamour in Glass returned me to that charming world and I can honestly say that I wish I could rent a country manor and live there full time. Gorgeous! 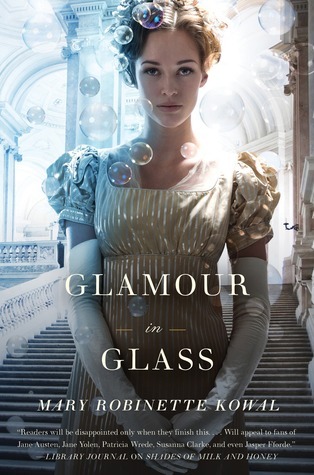 Join me after the jump for my review of Mary Robinette Kowal's latest, Glamour in Glass! Glamour in Glass picks up right after the union of Jane and Vincent. They have just completed a massive glamour mural in the house of an English noble and Jane has time to reflect on her life with Vincent. Oh, the joy he gives her. The love she feels for him. How wonderfully they work together. Excuse me while I clutch the book to my chest and sigh happily. As the book progresses, we learn that everyone in England is heaving a big old sigh of relief because Napoleon has been captured and exiled to the island of Elba. Finally, the continent is free to travel to again. Jane is anxious to get away from her family (who are still impressively annoying, even though they have only one scene!) and Vincent has an old friend of his in Brussels he'd like to visit. Off to the continent they go, luggage and glamour in tow. I'm sad to say that the book weakens a little while Jane and Vincent are in Brussels. They begin work on a new theory of glamour, trying to capture the ephemeral stuff in glass, and Jane discovers a shocking secret about herself. The secret takes her out of commission and leaves her without the ability to work her beloved glamour, making her feel useless and adrift. While Jane wrestles with her new constraints, Vincent grows distant. I admit, I was about as hurt and confused as Jane was by Vincent's distance and his sharp words to her. The idea that he might be doing anything to hurt her just killed me. I wanted to take him by his cravat, drag him into a hallway and yell at him. How dare he hurt Jane! Smart, sensible, noble Jane! Vincent, that cad! That scoundrel! That lout! Thankfully, the reasons for his distance are revealed mid-way through the novel and it changes the entire game. I was open mouthed in shock. I won't spoil it here, dear friend, but suffice to say... it was totally awesome! I completely did not expect it, I never saw it coming. It was brilliant! From then on, the novel picks up speed like a runaway train and all I could do was hold on for the ride. Glamour in Glass cemented Jane as a strong, smart and absolutely incredible woman who lets nothing stand in her way. The ending was epic and heartbreaking, and ended so tenderly. I'll be completely heart sick if there isn't a new volume! I implore you to pick up Shades of Milk and Honey and Glamour in Glass. They are intelligently written and exceptionally witty. Mary Robinette Kowal's has a special ability to weave a beautiful, captivating story. The unexpected surprises along the way make the journey with Jane and Vincent even more satisfying. If only Jane Austen wrote like this, then maybe I'd be able to get past two chapters of Pride and Prejudice! Pick up Mary Robinette Kowal's novels at any fine book selling establishment. Trust me, you do not want to miss these! Yep, I've had many books ruined for me because I couldn't turn my editor's brain off. I read book 1 based on your rec and really liked it. Looking forward to this one!